One legendary insect--enormous, white, and exceedingly rare--attracts trout of such size that they couldn't possibly exist in the world as we know it. But in Heywood's classic novel, such things can and do exist. 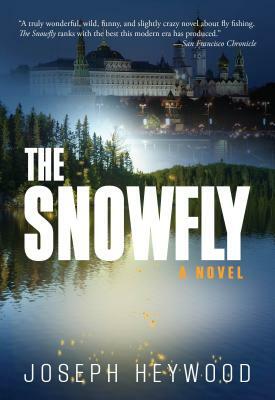 Protagonist Bowie Rhodes, UPI reporter and expert fly fisherman, had learned of the snowfly early in his childhood. It hatches every seven to ten years, never on the same river twice, bringing to rise trout so huge they would have to have lived forty years or more; trout so wily that they never allow themselves to be caught--or even seen; trout so hungry for this fly that they will risk exposure to rise for the hatch. The snowfly is the sacred quest of the most obsessed trout hunters, existing--it seems--only in myth and in a lost manuscript. Rhodes's reporting brings him to such sites as the jungles of Vietnam, the labyrinth of Brezhnev's Soviet Union, and a poisoned Canadian wasteland of uranium mines. His hunt for the manuscript, meanwhile, takes him deep into his own heart of darkness. Richly imaginative and sensual, the world of The Snowfly has more mystery lurking beneath the surface waters than our own. Or does it? Joseph Heywood is the author of Covered Waters (Lyons), The Berkut, Taxi Dancer, The Domino Conspiracy, the eight novels comprising the Woods Cop Mystery series, and Red Jacket (A Lute Bapcat Mystery). Featuring Grady Service, a detective in the Upper Peninsula for Michigan's Department of Natural Resources, the Woods Cop Mysteries have earned its author cult status among lovers of the outdoors, law enforcement officials, and mystery devotees. Heywood lives in Portage, Michigan. Visit the author's web site at www.josephheywood.com.